While we are all exposed to gender stereotypes, young people and children are especially susceptible to them when forming an understanding of their place and role in society. Children between the ages of 2 and 6 learn stereotypes about toys, skills and activities that are stereotypical associated with each gender, according to more than 150 scientific articles and books. Then, between the ages of 7 and 10, they start to attribute certain qualities to women and men. As they get older, these gender-based norms only become more ingrained. The school is an ideal environment to raise their awareness of these stereotypes and encourage critical analysis in students so they are equipped to draw their own conclusions. In Pinewood this year, whilst honoring International Women’s Day, we decided to inspire our elementary and middle school students to question gender stereotypes, whilst enabling them to make informed choices about their futures and broadening their opportunities. In elementary, we took inspiration from a European equality school project called “Redraw the Balance”. The goal was to transform the way our younger students thought about the world of work, right at the age where they are developing aspirations and ambitions, and where the gender stereotypes are beginning to be internalised. Our students were asked to draw people with exciting and aspirational careers; a police officer, a firefighter, an astronaut, and scientist. 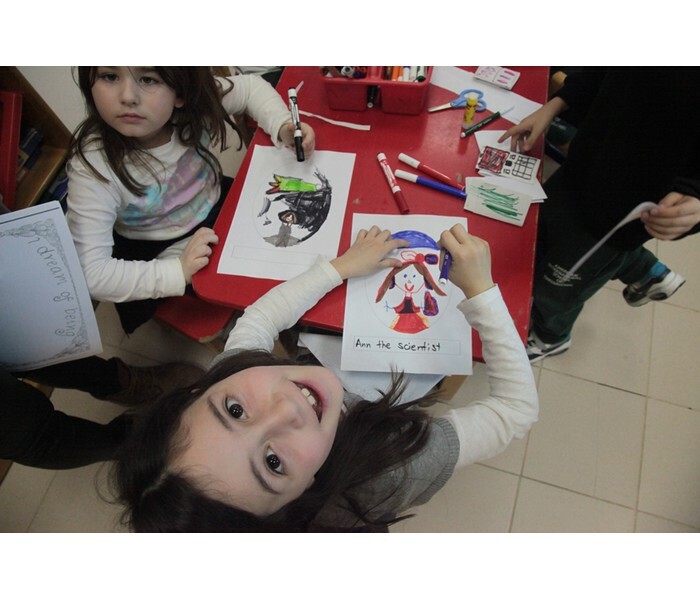 Our kindergarten and grade 1 students drew 29 pictures in total with 1 third of them depicting women. Our older Grade 4 and 5 students drew 33 pictures in total with only 7 of them depicting women. These trends support what research has suggested, that although gender stereotypes are introduced up until the age of 6, they are fully internalised by the age of 10. In order to redraw the balance, they were then shown videos of female real-life versions of these drawings, helping to break down gender stereotypes and preconceptions, whilst improving their life chances by inspiring them that the majority of jobs and roles today are available for women, and not just men. For our middle school students, we took inspiration from 1 global gender equality campaign (#likeagirl) whilst participating in the UN supported International Women’s Day social media global campaign. Initially, our students were asked to consider what the expressions “like a girl” and “like a boy” meant. We discussed the important of such phrases, their derogatory nature, and their consequences. Although many students use this language without the intent to insult, it was important to get them thinking about the underlying message and the impact their comments have had, rather than simply reprimanding such talk. Our students, through guided discussions, realised that these phrases, even though they were initially perceived as harmless, actually help create and sustain gender stereotypes, by turning one's gender into an insult. They were then introduced to the concept of feminism, as the belief that both women and men are equal and should be treated as such. Following this discussion, International Women’s Day was explained to them, as a global day celebrating the social, economic, cultural and political achievements of women, whilst marking the importance of a call to action for accelerating gender equality. In that spirit our middle school students watched a Ted-talk by Chimamanda Ngozi Adichie, and author and activist, titled “We should all be feminists”. After the video, we all took part in the global social media movement called "Press for Progress", organised by both the UN and the International Women’s Day organisation. Finally, it is important for us to realise that children are not born thinking one gender is more powerful than another, rather they are born thinking there are no differences between them and children of different genders. However, gender stereotyping is reinforced online, on television, songs, books, and games. Gender becomes for them an excuse for behavior and a restriction for future ambitions. So at Pinewood we tried to smash these gender stereotypes by making them accountable for their own actions and inaction. Therefore, for us as a school but also for you as families, it is important to start educating these young people about gender equality, to begin calling out examples of gender stereotyping, and to encourage them to question and dispute them.